1. Heat oil in a deep frying pan or shallow wide saucepan over a medium heat. Saute the shallot and garlic for 2 minutes, stir in the arborio rice and toast 1-2 minutes stirring. Heat the stock in a saucepan until the liquid begins to boil, keep warm. 2. Stir in one ladle at a time of hot stock into the rice, stirring occasionally until all the liquid is absorbed. Repeat until all the stock has been used and the rice is al dente. (If rice is still firm you may need to add a little more water or stock). 3. Stir in the dried porcini mushrooms and soaking liquid, along with the sliced mushrooms and butter. 4. Heat the smoked duck breast. Heat a frying pan over a medium high heat 2 minutes then place the smoked duck breast skin side down for 2 minutes to crisp the skin. 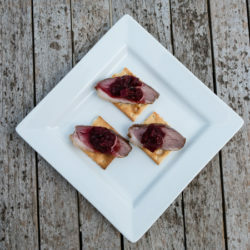 Allow to rest and slice duck breast diagonally into thin slices. 6. Serve risotto on warm plates top with sliced smoked duck and garnish with shaved parmesan, a drizzle of olive or truffle oil and finely chopped herbs. This photo is courtesy of Luv-A-Duck, and the recipe is adapted from their own recipe.